In case you missed it, a few weeks ago we enlisted the help of the Starbound Universe’s many talented authors and poets to fix a very serious problem posed by a bookish Floran called Leyla Lotusbud – there just aren’t enough books to fill the countless libraries spanning the infinite void of space. With nearly 300 entries, I think it’s safe to say we’ve completed Leyla Lotusbud’s quest! Nice work! We had to pick just five entries in the end, and it was tough – they were all really fun to read! It largely came down to which entries would best fit in a library setting. 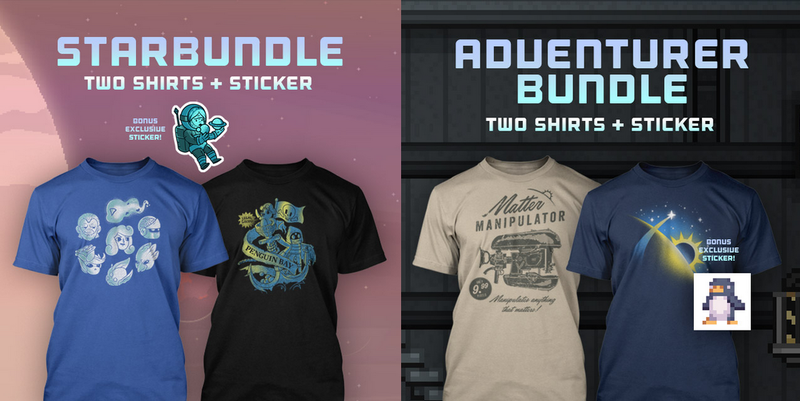 Those five winners will get to pick out some super cool prizes from our friends at The Yetee. If you’ve won, keep an eye out for an email from us! I only wanted to use the microwave. For the past three days I’d been heating my food over the barrel fires smoldering in the cargo hold (though, truthfully, I have yet to encounter a part of this leviathan ship that I would not qualify as part of the cargo hold), but this made everything taste of gasoline. Or maybe the gasoline taste was psychological. It’s not a raw deal, considering I had nothing with which to pay passage out of this star system except a promise to earn my keep. Better than the alternative (imprisonment, execution, or worse on Avos). It’s just that I hadn’t expected to need a handgun to protect myself from crocodiles on my way to the lavatory. I’d expected to be working among a crew of fellow travelers, given this ship is large enough to house a hydroelectric dam. But I soon discovered its only occupants were the captain and myself, and our journey through the Horsebutt Nebula would take weeks as we made hundreds of inexplicable pit-stops to excavate asteroids and expand the complex garbage ecosystem of the ship’s interior. Maybe there had been a crew, once, I thought, before the crocodiles. I opened the cabinet’s coin door and placed my bowl of uncooked pearlpeas inside. When I pressed the button that once read “insert coin,” a fan whirred and a maze appeared on the ancient cathode ray screen. I waited, but nothing seemed to happen. Experimenting with what remained of the joystick revealed it worked to navigate my invisible avatar through the labyrinth. At first, I was entertained by what seemed like a pleasant distraction, then the game took a sinister turn when I noticed a menacing shadow following me through its hallways. The maze provided no weapons, and when I attempted to flee, the shadow appeared on the opposite wall, growing ever larger. Only when I felt the sound in my belly–a low, stuttering creak like a buckling girder–did I realize the shadow was not digital. The crocodile’s growl preceded its charge from the ventilation shaft and gave me just enough time to unload my pistol down its throat. Perhaps turning myself in to the Stargazer militia would have been easier, I reflected. Not as rewarding, though. The arcade machine chimed. When I pried open the coin door, waves of popcorn erupted from it and cascaded across the sticky floor. All things considered, it didn’t taste half bad. Why did the Hylotl cross the stream? 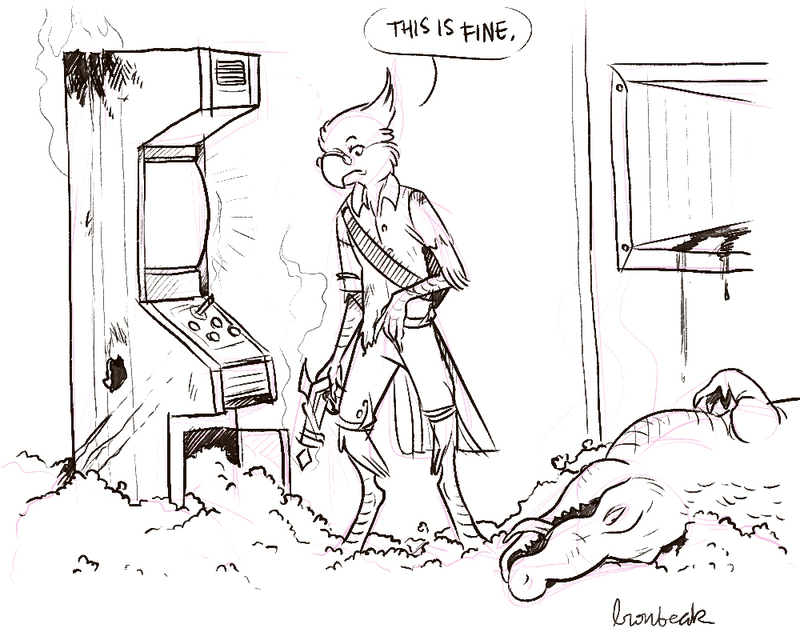 Why do Avians manage the worst sports bars? Because they never have any wings! What do you call a comrade who is behaving in an unorthodox manner? It doesn’t matter. Tell Miniknog. A rebel, a traitor, and a worthless excuse for a comrade walk into a bar. The man is quickly detained. Thank you for your patriotism, comrade. A grave. Remember, comrade: unorthodox behavior often ends in terrible accidents! What do you get when you mix “free-thinking” and rebellion? The privilege of a brief vacation. What do you call a room with fifty comrades in it? A wonderfully designed and comfortable Miniknog issued detainment room. There is an unwritten rule that states that for every adventure, there must be a monster. Whether it’s a dragon, a slimething, or a killer space-whale, such creatures are necessary prey to every aspiring hero. As such, it is no surprise that various individuals have traded tales of a mythical beast that roams the ocean of stars: the confounding Slibbler. Said to have a mooshy smushy body and various tongues growing haphazardly from its skin, it’s attributed with the recent disappearances of several personnel spacecraft. Presumably the creature latches on to ships, cracks them open, then “slibbles” the people inside, whatever that may mean. Perpetuators of these stories claim that the Slibbler’s tongues are in fact the tongues of its victims, taken as some sort of twisted comedic trophy. One spacefarer declared that he had seen a Slibbler. However, contrary to common belief, the Slibbler wasn’t hostile at all. It floated over to a dirty spaceship, licked it clean, and then departed without a trace. The spacefarer also insisted that the Slibbler made a noise similar to that of “blowing raspberries,” but everyone knows that in space, no one can hear you pbbbt. missionary work is more difficult than I anticipated. Despite the training we received, I was woefully underprepared for creatures such as these. The morning began as peacefully as one could expect on an uncivilized planet like this. Nonetheless, it was chosen so that I may spread Hylotl peace to the less fortunate, so I was determined to “rough it.” I placed my tea atop a gentle flame and eased myself into my morning meditation as usual. However, I could hardly achieve a state of enlightenment for the cacophony that soon assaulted my ears from beyond a hill! revealed these to be Novakid, a primitive gaseous species. The two, glowing blue and yellow respectively, whooped and hollered as one strummed a guitar, creating some semblance of music. returned with their names, the blue one “Bonnibel,” the yellow “Nym.” They possessed a most ridiculous accent. Nym extended his hand, and I, assuming it was a customary greeting, reached out in response. The savage shook my hand with a vigor that nearly toppled me, the whole exchange quite uncouth. Determined to civilize these ruffians, I invited them to tea, as tradition dictates. They seemed very excited at the prospect, eagerly following me back to camp. My tea boiled, and as I prepared the proper settings the Novakid perused my camp. There was not a single ornament they were not curious about. Their filthy hands touched all my perfectly-aligned furnishings. They shattered my favorite coral sculpture! Nevertheless, I knew I could enlighten them. Over tea, I spoke about opening their third eye to the world. They seemed to barely pay attention. The tea I served was my finest blend, but after a single sip they dropped my cups, shattering them on the floor! I struggled to remain calm as Bonnibel removed a jug of some liquid and passed it between herself and Nym. “Perhaps I could earn their trust by partaking in this cultural tradition,” I thought. After a hesitation they allowed me the jug. “Maybe they’re warming up to my teachings after all.” Those thoughts faded away after I lifted the jug to my mouth. The drink burned down my throat, and after one sip I fell unconscious. When I awoke, Bonnibel and Nym were gone, leaving me in my battered camp nursing a terrible headache. I end this note with a warning for your missionary travels, Itsuki. Never invite a Novakid to tea. ← [STABLE] Pleased Giraffe is here!